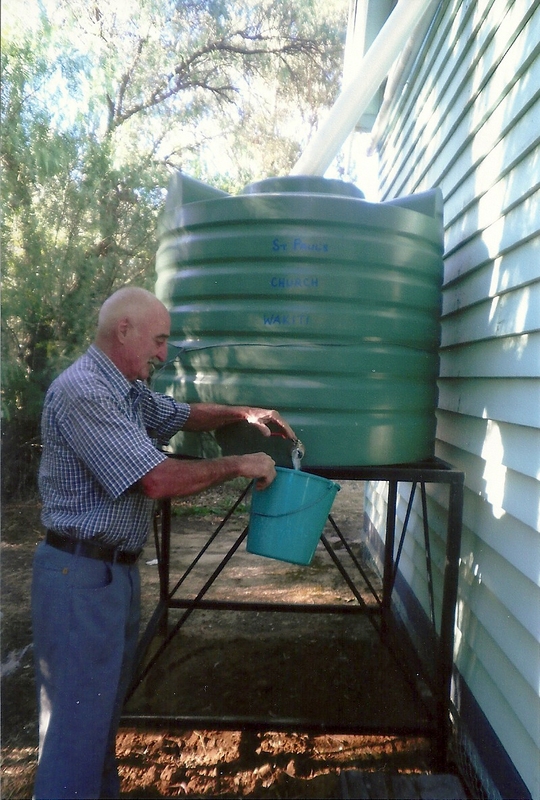 Tony Whittaker drawing first water from tank. After Sunday service of Holy Communion, the congregation adjourned to the back exterior of the church to celebrate the installation of our new rainwater tank. The fact that our summer drought had broken and thus christened the tank with some water added to the excitement of the occasion. Tony Whittaker turned on the tap and the water flowed marking an historic moment in the life of our building. Prior to this occasion all water for the various purposes of church life had been carried in by human endeavour. Think of all those gatherings to celebrate this and that, all the cleaning of floors and walls, gallons of tea consumed and the water used to dilute the communion wine when the vicar had under estimated the size of the congregation (not often) and even just to drink… since 1885. Unfortunately, our rector Sally Boothey, was unable to be present as she had to rush off to conduct services at Nathalia and then Numurkah, these 2 larger churches seizing, by the advantage of superior numbers, the more comfortable times for their services; however, we had the pleasure of appreciating the beauty of the rising sun. We were led by Rev Sally in a prayer of thanksgiving for the gift of rain, in due season and not in excess of course, with which to fill our tank. The celebration for our new tank was marked by several speeches to thank Tony and Gilly for all the organization and work they had put into the buying of the tank and the construction of the stand and also for our anonymous benefactor who we mustn’t forget for all his support with this venture and many others. The congregation then retired for morning tea in the church not made with the tank water you will be relieved to hear! We have decided to dispense with the First Flow. The Parish Secretary was overheard to wonder if the famous Tank had been made out of gold but parish secretaries and treasurers are always inclined to be making depressing remarks about church finances and “other things”. By Joan Harding our reporter on the spot.